The productivity of any repairing shop is determined by the efficiency of the pneumatic system formed by the compressor, the hoses, and the air tools because they allow getting done a wide variety of works quickly and with security. The core of this system is the air compressor; which provides power to the pneumatic tools. Selecting the best air compressor for automotive air tools is not space science, it depends on several factors but the main thing you need to be clear is the airflow requirements of your air tools, since the total air flow required depends on them and by the way, the size of the air compressor. What size air compressor do I need to run air tools? What is the best brand of air compressors? What is the best portable air compressor for auto tools? Conclusion: Choosing the best air compressor for automotive air tools. – For drilling or cutting, we have drills, grinders, chisel hammers and saws. These tools consume 3 to 8 CFM at 90 PSI. – For hitting, bending or chiseling there is the pneumatic hammer; which can consume from 3 to 11 CFM at 90 PSI. – For tightening there are air ratchets, impact wrenches and screwdrivers. These require 2 to 10 CFM at 90 PSI. – For finishing works are pneumatic sanders, polishers and paint sprays that need a supply of 8 to 12.5 CFM at 90 PSI. – For clamping, there are nail guns and staplers and riveters. These tools may require 0.3 to 2 CFM at 90 PSI. – Finally, for jobs where air pressure is required, blow guns, tire inflators and sandblast guns are used. These can consume about 3 CFM at 90 PSI. The sum of the CFM of your pneumatic tools will serve as a reference to find the compressor that best suits your needs. At this value of CFM, you must add a clearance of at least 30% to compensate for pressure drops that may exist in the lines and to foresee the addition of any tool in the future. You should also think if your compressor needs a tank. If some of your air tools work by cycles and you always will carry out your work in the same place, it’s better to get one with a tank. A tank with sufficient capacity will make stops and starts of the compressor motor less frequent and this will allow a longer lifespan. Currently, California Air Tools is one of the best pneumatic tool brands in the market. Many of their products are bestsellers. Their products are engineered with advanced technology to offer high quality, reliability, and durability. and the Industrial Series of Ultra Quiet & Oil-Free Air Compressors; designed for professionals and manufactured with high-performance components that produce high levels of air flow. In the market, there are compressors whose main virtue is to be portable, which allows you to mount your compressor in your truck and take it where you need it. 5HP 10-Gallon Pneumatic Portable Air Compressor With Tank. It features 3.5 Peak Horsepower and 125 PS of maximum pressure with a 10 gallon cast iron tank, an oil-lubricated motor, and solid moving wheels. This compressor is fine for painting works with sprayer pistols, for example. It is relatively quieter than others compressors and fills the tank very fast. It delivers only 3.5 CFM at 90 PSI and 7.2 CFM at 40 PSI, so most probably you would have to use it with just one or two air tools at a time and those tools shouldn’t require a lot of CFM. It is provided with dual lines that make easier keep different tools connected. This is not suitable for professional use but if you are a garage user or you like to do little weekend domestic projects it will fit perfect for you. Besides, it is relatively cheaper than most of the portable compressor of the market. The manufacturer doesn’t offer a good manual, or sometimes it doesn’t come with the apparatus and it isn’t available online. This compressor is designed to be really one the quietest in the market. It produces a low sound output (only 68 dBA), which is a relatively low value. It has an oil-free and maintenance-free pump. It performs very well in a rate of use of 8 to 10 hours per day, or inclusive shows excellent performance at a continuous use day after day keeping the level of pressure and fills its tank quickly. Its key components are designed for long durability. It works at 125 PSI of maximum pressure, offers 2.4 CFM @ 90 PSI, provides 1.00 HP and consumes 7.5 Amp. This is a portable vertical electric air compressor with large and durable wheels, what makes it easy to transport. It is intended mainly for minor tasks like inflation, painting, stapling and nailing. It achieves its objective without any major issues. Power Source: Electric with a cord. 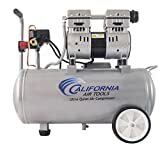 This compressor is a nice piece of equipment, very simple to use, and highly recommend it for light domestic works like blowing out, power a brad nailer, inflate tires, painting with sprayer guns and so forth. You shouldn’t use it for a heavy work with an air hammer or an air drill, for example. According to the manufacturer it requires minus than 3 minutes to fills its tank. Minor assembly is required out of the box and the customer service is very good. It only produces 60 decibels of noise so it is very quiet. It is provided with an oil-free pump, it offers 1.0 HP while running, 3.00 CFM at 40 PSI and 2.20 CFM at 90 PSI, works at a maximum pressure of 12 PSI and consumes 8.5 Amp. Now you have information to select the best air compressor for automotive air tools, you can go to your local store and enjoy a while selecting a new toy for your garage or your repairing shop. 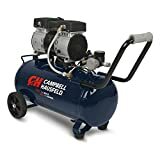 Besides, you have seen some of the best portable air compressors for auto tools, among which I favor the California Air Tools 8010 Air Compressor which in addition to being as effective for light work and generating as low noise levels as the Campbell Hausfeld DC080500, is more economical and lighter.